As the seasons change so does the way we eat. Autumn is the season where our bodies require different types of foods to stay balanced as we prepare for the transition to winter. This time of year is my favourite. Their is something magical about the cooler mornings cuddled up in a fluffy robe with a hot cup of tea (i’m a bit of a nana like that). With the mornings and nights becoming chillier, it is great to start incorporating more warming and wholesome foods into your diet. Our digestive fire is stronger this time of year so heaver meals are more digestible. I’ve been making these bowls a lot- as you may of noticed. They are such an easy way to include lots of nourishing goodness in one meal! It’s also fun to experiment with different combinations of veggies. I’ll talk about some of the benefits of the ingredients and why I love them! Lentils are a great source of insoluble fibre which help to prevent digestive disorders such as irritable bowl syndrome. They are also high in protein, vitamins and minerals, and as a bonus are low in calories. Just a quick tip–> Lentils are best soaked at least 8 hours in water prior to cooking. I’ve found this to be a great way to make them easier to digest and to prevent any uncomfortable gas. Basmati rice has a light fluffy texture and is gluten free, low in fat and is also very quick to cook. I added roasted pumpkin and pan fried some brussel sprouts in a little coconut oil (yum). If you haven’t tried them pan fried you’re in for a treat! I always have sauerkraut in the fridge because it’s a great source of probiotics which is great for your digestive health plus a tasty addition to you meal. 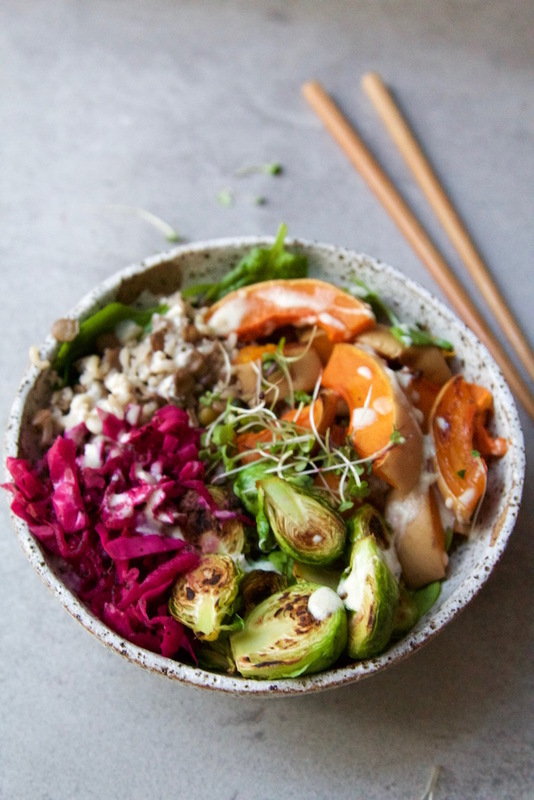 All of this goodness combined with some greens such as spinach or kale and a creamy tahini sauce, you’ve got yourself a delicious and highly nutritious meal. Soak lentils in water at least 8hrs prior to cooking. Start with roasting the pumpkin in the oven. Pre heat oven to 180*C, cook for about 30-40 minutes until nice and soft. Add the lentils, rice and water to a medium saucepan and let cook for about 20-30 mins, once cooked, poor out remaining water and let sit with the lid on. Cut brussel sprouts in half and cook in a frying pan for about 15 mins with coconut oil until it starts to get soft and starts to brown. To make tahini sauce, mix tahini, lemon juice, soy sauce in a mug and add small amounts of warm water until it thickens. (don't add too much water or it may become too runny). Get a bowl and first add in greens then rice and lentil mix, add all remaining ingredient and top with a drizzle of tahini sauce and extra lemon or soy sauce if needed. 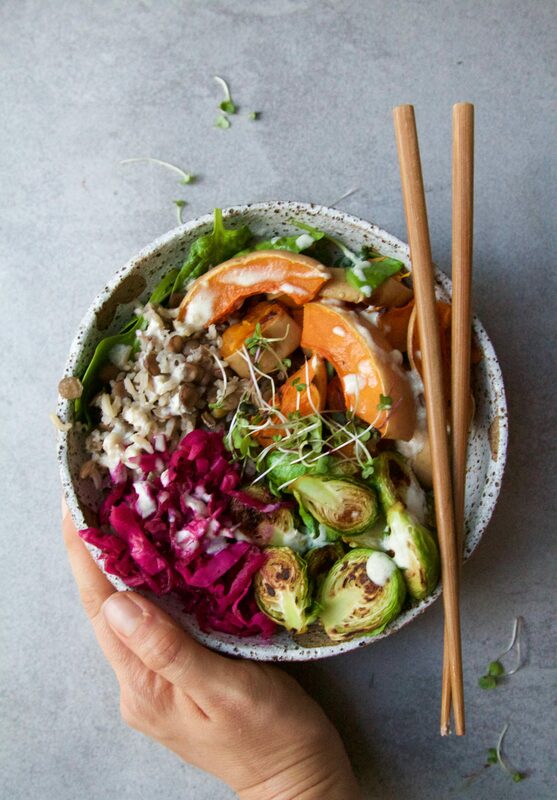 I love nourishing bowls full of healthy vegetables, leafy greens, plant-based proteins, whole grains and healthy fats such as tahinis, avocados, seeds or nuts! 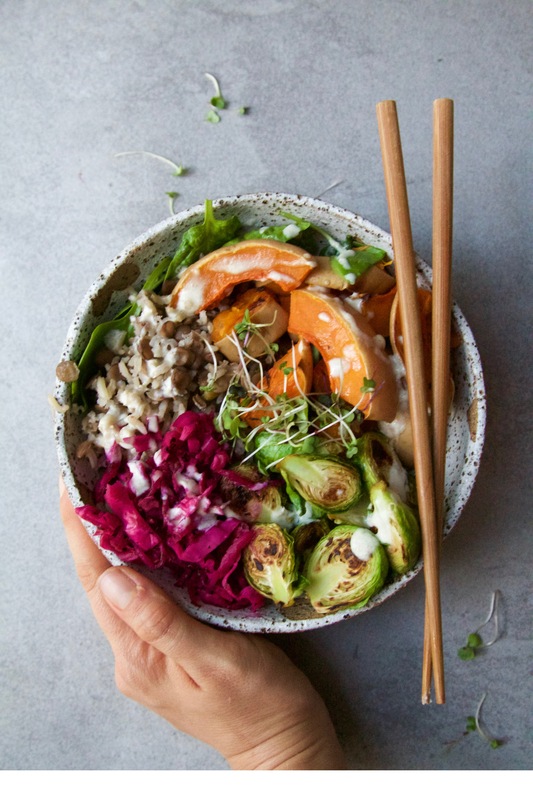 You have featured my favorites–pumpkin and Brussel sprouts–to create such a lovely and amazing dish!